Back To The Kitchen: Happy Fathers Day! The gift of having an extraordinary male figure in your life is so important and one I wish for all children. I was a daddy’s girl and so is my daughter. On this day I celebrate all dads, grandpas and dad-like figures. 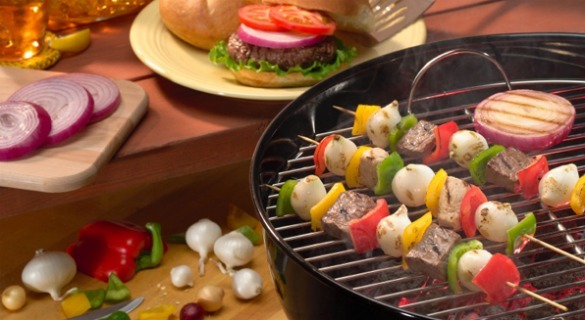 Unlike Mother’s Day where we spent hours trying to figure out ways to pamper our moms, the traditional Father’s Day has poor dad slaving over the grill. Teaching my brothers to grill was a rite of passage (kind of like carving the Thanksgiving bird) and I’m sure he would have taught me if I had shown an interest. My first lesson in BBQ was when I left home and invited about 20 people over and realized that I didn’t have my daddy to grill for me. At one point I tipped the BBQ (I was wearing white) and I think the chicken was black on the outside and raw on the inside. I have since worked with some “Master Q-uers” and learned the art and technique of grilling. I love to grill everything from meats to fish and every veggie in between. You can always grill extra and have leftovers for the week. I like to have a well-rounded menu with a lot of variety. I love add asian-fusian flavors to steak and salmon. Usually I just steam my artichokes, but I lprefer the smokey flavor that comes from throwing them on the grill. In the coho salmon recipe below, I often switch out the chanterelles for fresh morels, but the mushroom farmer at the open-air market said that the morels are not very good this year (as well as super expensive), so I get them dried and soak them in water. Aside from my daughter, the best gift her dad gave me was his family’s “Slick BBQ Sauce.” My friends always request it and use it generously so be sure to make plenty. You can always add grilled veggies, corn and a big green salad for larger gatherings. And since my dad was not much of a dessert eater, we always found that ice cream and fresh fruit can be a great simple finish. I was so blessed to have a dad that was loving, giving and truly present…well, most of the time if the 49ers weren’t playing! I know this to be true because of the excellent fathers my brothers have become. Sadly, my father passed at the age of 52, and while I miss him terribly I always feel his love and guidance. Enjoy these recipes and embrace all of the amazing men who have touched your life whether he is your biological or stepfather, a close family member or friend. In a shallow baking dish whisk together all of the above ingredients (except the meat) mix well. Place meat in the baking dish coating well on both sides. Let marinade overnight (at least 4 hours) Grill over medium heat for approximately 10 minutes per side for rare. Add about five minutes per side for medium rare and on up. To serve, cut steak diagonally into thin slices and transfer to a platter. Juice and zest of 3 tangerines or clementines. (My daughterEmma calls them Ferry tangerines). If not in season, oranges will do. In a bowl, mix all but the salmon. I like to marinade the fish for about one hour. Grill over med-low heat for about 7 minutes per side. Sauté the chanterelles, fennel, and leeks in butter until soft and lightly browned. Add the chicken stock and cream. Reduce for 3 to 4 minutes. The sauce should be of medium thickness and have a rich ivory color. Season with the salt and pepper. Oil and grill the salmon to desired doneness. Remove to a serving plate. Spoon the sauce over the fish, and serve. Whisk the rest of ingredients until blended. Mix in the pasta. Let stand in the refrigerator for at least 4 hours. Before serving toss with the garnishes of your choice. Combine limejuice, ginger, and honey in a small bowl. Whisk in olive oil and season with salt and pepper. Set vinaigrette aside. Combine black beans, papaya, and red onion in a large bowl and toss together. Pour vinaigrette over and toss again. Cover with plastic wrap and refrigerate for 30 minutes. Add mint, toss again, and serve. Mix together cabbage, wassail, mayonnaise, and vinegar in medium bowl. Chill for 2 hours or overnight.